Dr Kevin Bonham: Government Retirements Are At Nowhere Near Record Levels ... Yet! Government Retirements Are At Nowhere Near Record Levels ... Yet! 1. There are widespread claims that the number of Coalition MPs announcing their retirement prior to the 2019 election is at a record high and that this is a predictor of a crushing loss. 2. Although both these things may well later become true, for the time being such claims are premature. Larger numbers of government MPs have retired at most recent elections than have so far announced their retirements for 2019. 3. Historically there is a very strong relationship between the rate of government retirements (from both houses) and election outcomes in the House of Representatives. 4. The relationship between Opposition retirement rates and election outcomes has been weak if it exists at all, although a very low retirement rate was recorded by the winning Howard Coalition opposition in 1996. 5. While retirements can make it more difficult to hold seats, the historic pattern is most likely explained by government MPs retiring in expectation of defeat, or retiring as a result of factors (such as leadership ructions) that are likely to contribute to poor results. Recently three government Ministers (Kelly O'Dwyer, Michael Keenan and Nigel Scullion) announced their intention to retire at the 2019 election. This has set off a flurry of claims that the rate of government MP retirements is some kind of record and that what is happening is unprecedented in the history of Australian elections. Surely this record level of rats fleeing a sinking ship is a harbinger of a crushing defeat unseen since at least 1975, or so the narrative goes. In fact, all this is wildly premature, and shows that many people have extremely short memories. It's widely expected that there will be several more retirements announced, and it could be that the number of retirements eventually sets a new record. But at this early stage, that is nowhere near being the case, and the number of government retirements so far has yet to even reach the average total for recent years. Yet, bizarrely, it is being treated as if an unprecedented mass exodus has already happened. This is really odd when, as I write, more Labor MPs (8) than Coalition (7) have announced they will not contest the 2019 election. A politician retires from federal politics when they formally complete their term in office, but do not recontest the next election. This is the case no matter what their age, what their circumstances, or how long they have been in office. A politician resigns when they formally surrender their office before their elected term is completed. Many of the MPs who are currently announcing their impending retirement are being incorrectly described in some circles as having "resigned". One defence I've seen of this is that we don't normally describe someone as "retiring" when they simply change jobs partway through their working life (though even then there are exceptions, such as "retiring from Test cricket"). But if the test we apply is leaving professional life entirely, then by that standard even those federal MPs who decide not to recontest at past normal retirement age have often not "retired". An example is Philip Ruddock, who quit federal politics at the 2016 election at 73, but is still professionally active in politics, including now as Mayor of Hornsby. One can retire from federal politics without retiring overall. Another point I'd like to make here concerns double standards. The early departures of Kelly O'Dwyer and Michael Keenan, who have both cited family reasons, are being interpreted as evidence that they expect the Coalition to lose the election heavily, possibly losing their own seats in the process. The implication is that if they thought they were a fair shot of winning government, they wouldn't quit. Or these announcements are interpreted as evidence that these MPs are bruised by the leadership ructions last year and would otherwise be staying on. Perhaps these things are true, but we can't know. On the Labor side, with more than a fair shot at being in government again, Kate Ellis has announced her retirement for family reasons, and Tim Hammond quit mid-term for the same reason without ever being part of government. One can be as cynical or as credulous as one likes about politicians leaving politics to "spend more time with their families" but whatever standard one adopts, it should be applied to all parties. * Julia Banks (Independent ex-Liberal) who initially announced she would retire at the election but has since left the Government and is contesting a different seat as an independent. * Jane Prentice (LNP) and Barry O'Sullivan (Senate, LNP) who were defeated for preselection. * David Bushby (Liberal, Senate) who resigned before the election and who was not up for re-election in 2019 anyway. * A Member of either house counts as retiring at the election only if they were not an election candidate. Resigning immediately after the election does not count, not even if they resigned before their Senate term commenced. * Senators sometimes resign from the Senate in the leadup to the election thus giving their replacement some time in the position. I do not count these as retirements at the election. * I distinguish between a major party MP retiring and losing preselection. Loss of preselection is effectively a career-terminating event unless the MP wants to continue their career outside the party, and most attempts to do the latter fail. An MP who loses preselection might respond by not recontesting or by recontesting as an independent; I treat these as the same. However I don't take into account whether an MP who announced their intention to retire was facing inevitable preselection defeat (a common situation with scandal cases) as there is not enough information on many such cases. * I count a Senator as retiring if they announced their intention to retire following an unfavourable preselection outcome that still left them on the ticket, even if in a position said to be "unwinnable". However I do not count them as retiring if they were de-selected from a Senate ticket altogether. If a Senator was de-selected from all positions expected to be "winnable" and it is unclear to me whether or not they had the option of accepting an "unwinnable" position, I treat them as de-selected. * For percentage terms for 2016 I treat all Senators as having the potential to retire at the election. However the fact that it was a double-dissolution would have made Senators who were partway through their term less likely to retire. As it happened only three major party Senators retired at five years into their elected six year terms, and none retired two years in. However there was the strange case of Joe Bullock, who technically resigned but whose resignation ended up having a similar effect to if he had retired at the election. I haven't counted him, but there is a case for doing so. As can be seen, while many people are reacting as if the number of government MPs to retire already is unprecedented, the total (7) is actually yet to pass the totals for any of the last ten elections! But it will - it is just a question of where the total eventually ends. Here it is in chart form with the percentage retirement rate in each case and the result shown. * The relationship between Opposition retirement rates and the result is weak, if it exists at all (it's not remotely statistically significant.) The Coalition had the lowest retirement rate in the sample in winning in 1996 but a very high rate in 2013. * All six governments with lower or trivially higher retirement rates than their opponents won. The Hawke government narrowly won in 1990 with a substantially higher retirement rate than its opposition, but the other three such governments lost (1996 (massively higher), 2007, 2013). 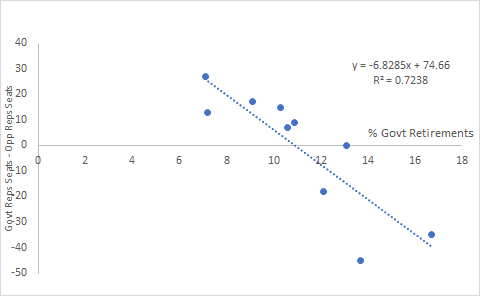 However, the correlation between the comparative rate and the seat result is weaker than the relationship between the government rate and the seat result. 1. Government MPs are more likely to retire, all else being equal, if they think the election will be lost. 2. Governments are more likely to lose when they have experienced events, such as leadership ructions, that increase the chance of MPs retiring. The last three elections have had the greatest combined Government and Opposition retirement rates in the sample, although only one of them saw a change of government. As we stand going into the 2019 election, Labor's announced retirement rate is so far higher than the Government's. But this doesn't mean anything predictively, since it is the final rate that has been analysed above, and we don't know what that is yet (for either side). Also, Opposition retirement rates may be little more than random noise predictively. One would think wavering Opposition MPs would be much more likely to hang on if their party looked like winning, but maybe this isn't the case. Maybe when an Opposition looks like winning, they attract a stronger field of preselection aspirants and this makes wavering Opposition MPs more likely to quietly throw in the towel to make way for new blood. So far the retirement rate for this government at the 2019 election is "only" 7.7%. If there are at least four more retirements then the past relationship suggests the government will probably lose, and if there are many more than that then the probability of defeat and in particular heavy defeat increases. However, perhaps this time the relationship will work differently. Sometimes, MPs' decisions about retirement are influenced by public perception of the message they will send if they retire at that time. If it turns out that only another one or two MPs retire, I wouldn't conclude from that alone that the government would be likely to be returned. Rather, that could just mean that in the face of a perception that a flood of retirements signalled impending doom, the government somehow found a way to discourage remaining waverers from quitting in order to reduce the level of panic among its supporters. It would be interesting to look at rates for elections pre-1990 (eg 1975) but I will leave that for someone else or for another day. Update 14 Feb: Senator Jacinta Collins has switched from a retirement to a pre-election resignation. Very technically this cuts Labor's tally of retirements at the election to seven, the same as the Coalition, but such cases are a little confusing to classify (cf Bullock) - how long before the election does one draw the line? Update 21 Feb: Government retirement number eight: Julie Bishop. Update 1 March: Government retirements numbers nine and ten: Stephen Ciobo and Christopher Pyne have announced they are going. They take the number of currently serving Ministers who are retiring to five, and the number who have served as Ministers at some stage to six (eight if you include Assistant Ministers). (However, Ciobo will step down as Minister immediately, and there may be a reshuffle to replace other outgoing Ministers). This isn't a record yet either; in 2013 nine MPs who had been Ministers at some stage of the term retired at the election (three of them had ceased to be ministers prior to this.) A difference between this and 2013 is that in the latter case a number of Gillard government ministers retired at the election, but they also (with the exception of Stephen Smith) left the ministry before it. In this case, only Julie Bishop has quit the ministry on account of the leadership ructions last year. Incidentally, I've found some older retirement figures (though I haven't had time to write them up yet) and in 1983 (when the Fraser government was defeated) only two Coalition MPs retired. A partial reason for the high number of government retirements nowadays when defeat is expected has been found in pension arrangements for the remaining pre-2004 MPs. They get a benefit based on their salary over their final three years, creating an incentive for government MPs and Ministers in particular to quit rather than going into Opposition. Update 15 March: Government retirement number eleven, Craig Laundy, has been announced, to nobody's surprise. 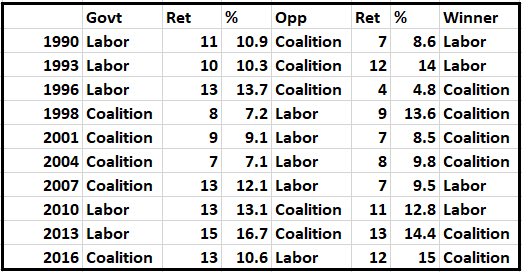 The 15 from Labor in 2013 rather stands out doesn't it? A number of good people left - possibly because they could see defeat coming and didn't want to sit on the futile side of the House, but in quite a few cases simply out of disgust with the dumping of Julia. Similar mixed motives at work among the LibNats at the moment, I expect.